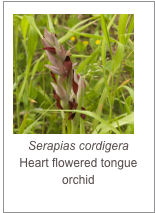 The only orchid to flower in the autumn Spiranthes spiralis is relatively rare. It presents as a bright green spike with tiny white flowers arranged in a characteristic spiral which gives the plant it's name. In close up the flowers are seen to be neat little pure white orchids with a green throat, the lower lip is frilled and glistens with grains of pollen.The leaves are not present at the time of flowering. Found in shady places in olive groves and in pine forrest.